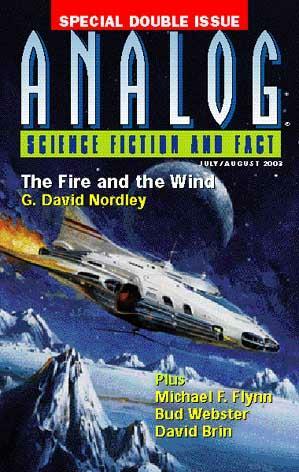 G. David Nordley. The Fire and The Wind. The story starts with a stark warning to the main character than in space, whilst oxygen is a friend, in the wrong circumstances it can be lethal. A crew of students with the lunar rescue squad find themselves pitched into a dramatic rescue, but with an unusual location – Antartica. The mission is complicated by politics that means that the rescuers themselves are at risk. A fairly routine thriller, spoilt a little by the stereotyped Russian ensign speaking pidgeon-English. However, he does have the spark of intelligence that turns the tables at the end. Da. Robert R. Chase. The Meeting of Pilgrims. A sequel to stories from July 1987 and 1995, and I would guess that the story in hand might benefit from knowledge of those stories. Politics, both inter-species and iner-familial, are the backdrop to the return of a human child kidnapped many years ago and swopped with a native. Drama is built up in the return of the child, although it appears somewhat artificially built up. In the end a whole load of stuff about the planet and its future (or lack of it) is revealed, but without impact as the reader hasn’t (at least from this story) built up an attachment to the planet or its denizens. Ron Goulart. The Robot Who Knew Too Much. Another humorous story featuring the ex Mr and Mrs Quincade, the male part of which is now robotic. Sarah A. Hoyt. Traveling, traveling. In the middle of the countryside a small community is trying, in vain, to resist the blandishments of modern technology. They have succeeded, up to a point. But the final paragraph (in which instantaneous matter transporation is invented – ta-raa) suggests that they are facing a losing battle. To be honest, an editorial snipping of these unnecessary final paragraphs would have helped the story. Grey Rollins. Not a drop to drink. Settlers find that their now planetary home is not as welcoming as they had thought. A lack of drinkable water gives every indication that their tenancy will be short-lived. That is, unless they genmod their children in utero, to enable them to drink the water that is available. This causes consternation amongst the more extremist religious settlers, who see it as a travesty against God’s work, and confrontation takes place. Bud Webster. Triumph in the Desert. A prequel to ‘Bubba Pritchett and the Spae Aliens’ (July 94) and ‘The Three Labours of Bubba’ (June 1996), in which the eponymous young man’s first contact with aliens is described. David Brin. A Professor at Harvard. A somewhat classier story from Brin. He teases the reader through, in letter form, historical research which traces one individual, and then ponders just how much influence a single person can have. The quantum Earth in which the writer resides is then revealed. Richard A. Lovett. Brownian Motion. A more hi-tech approach to blind dates proves equally unsuccessful. Nicely written, but fundamentally not sf. Carl Frederick. The Spacemice Incident. Meeses cause problems in space, as do dishonourable wily Chinese (cue second racial stereotype for this issue). A story which actually makes you sit up and pay attention. Something strange is going on – with a hacker up to no good. It transpires that the hacker is trying to increase his odds of getting onboard a generation startship. Finally thwarted, he sends out his evil little AI agents to do his dirty work on board the ship. A virus is decimating a spaceship’s crew, and finally the medical team are infected. Can they find a medical solution that will save them and their remaining colleagues? Pat Yorke. Home on the Range. An extremely wealthy couple find their beautiful gardens under threat by buffalo of all things, and their ingenuity is stretched to find a solution. Alexis Glynn Latner. Trinity Bay. A glider pilot spots a rapidly growing nano-plague, and struggles to fly out of danger and to make a safe landing. Michael F. Flynn. Still Coming Ashore. Another in the Irish Pub series. In this one the fact that evolution never sleeps is recounted by a woman with a distressing tale. Begorrah. For a double issue a fairly disappointing collection. Brin and Kennett provide stories which rise above an otherwise OK but relatively routine bunch of stories.